The 2019 Olivier Awards nominations were announced yesterday, with Six up for five. For a student-created show that debuted at Edinburgh Fringe in 2017, Six has skyrocketed to the highest ranks of London theatre. The performance starring all six of Henry VIII’s wives joins Come from Away, Tina, and Fun Home in the Olivier category for Best New Musical. These are the biggest players in the West End, and Six has incredibly but undeniably earned its place among them. Written by Toby Marlow and Lucy Moss, and directed by Moss and Jamie Armitage, Six is not like musicals you’ve seen before. Framed as a pop concert/X Factor competition, the ex-queens take turns singing their stories, all vying for the title of Who Had It Worst with the infamously bad-tempered King Henry. Divorced, beheaded, died; divorced, beheaded, survived. The six songs are as different as the six women. Marlow and Moss cover the range of pop, drawing influence from modern queens Beyoncé, Adele, Ariana Grande, Nicki Minaj, Lilly Allen, and Alicia Keys. 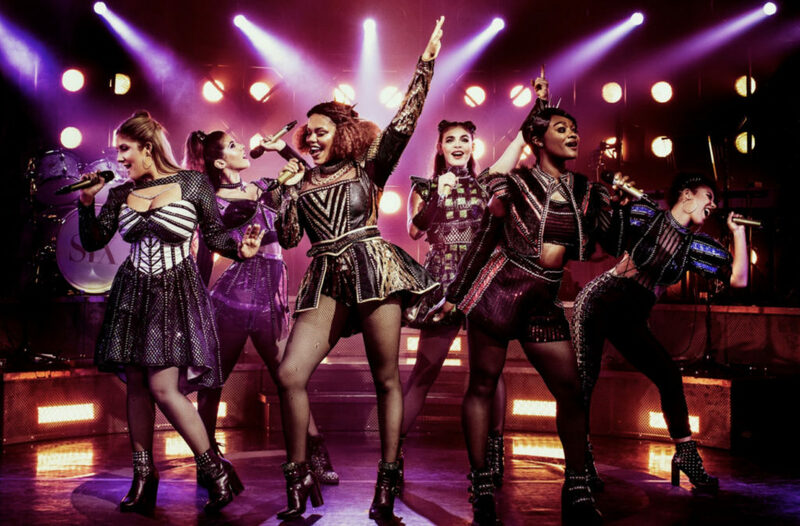 Genuinely hit-worthy music, beyond-clever lyrics (rapid-fire historical references spun with millennial-modern allusions), and knock-out performances (from the queens as well as their all-female live band) combine to create a formidable new contender on the musical scene. Jarneia Richard-Noel (Catherine of Aragon), Millie O’Connell (Anne Boleyn), Natalie Paris (Jane Seymour), Alexia McIntosh (Anna of Cleves), Aimie Atkinson (Katherine Howard), and Maiya Quansah-Breed (Catherine Parr) rock the glittered combat boots and Tudor-punk, power-glam outfits that have earned Gabriella Slade an Olivier nomination for Best Costume Design. The queens belt out their songs and slay their choreography with the same energy you’d expect from the real-life divas who inspired them. McIntosh stands out for her excellent comedic presence. Although it may seem dubious, considering the premise involves Henry’s wives competing over who had the worst marriage, the show is undoubtedly feminist. The six women take the microphone to reclaim their stories – to give their perspectives, which have been left out of the history books. That they all perform as each other’s supporting vocals and backup dancers effectively reveals the facetious nature of their rivalry. They’re really a team. And although they only come to this realisation in the end, the show spends the whole time arguing they were people, not just wives. Six is largely tongue-in-cheek. It’s funny and fun more than it’s informative. The whole thing is joyously playful, surprisingly fresh, and wildly entertaining. There’s a delightful, amateurish silliness to the concept, which seems to stem from a couple of sleep-deprived students procrastinating their History final. (Recent Cambridge grads Marlow and Moss wrote the play during their exams). Six has had an incredible journey, from its beginnings at Edinburgh Fringe just two years ago, to the five Olivier nominations it received yesterday. This is one of the hottest shows on right now, created by brilliant, talented young artists who are shaking up the West End. Knights of the Rose is a new musical created by Jennifer Marsden and directed by Racky Plews. 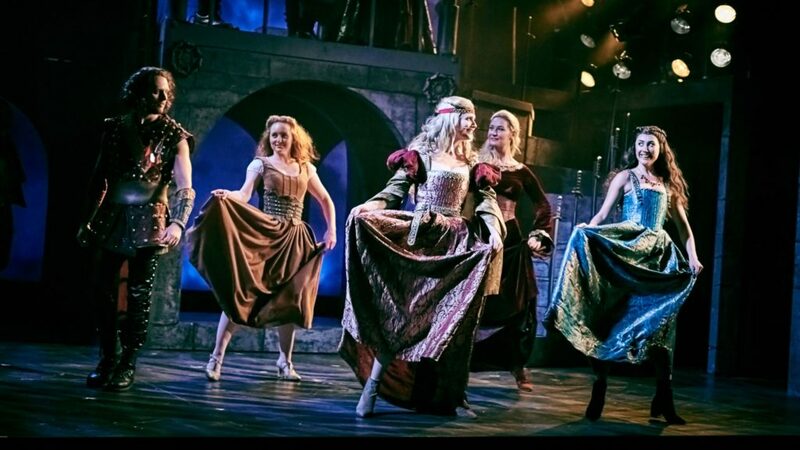 The musical is a take on many of Shakespeare’s romances mashed together to 80s pop rock, set in a Camelot style kingdom, with the focus characters being members of the house of Rose. Royalty and knights alike. I arrived with no expectations for this show. My first thoughts, was that it seemed laboured. The show did not give off a slick West End musical vibe, rather it radiated a pantomime like energy. With laughter arriving in unexpected places, I was unsure if it was supposed to be funny, or if the corniness of the music became too much for the audience. However the cheesiness of 80s pop rock, was matched well in some moments with the melodramatic Shakespearean style and narrative. The story mashed up all of Shakespeare’s great love stories, and threw in some Macbeth and Lord Byron. The literary references were a nice concept, however occasionally executed sloppily. An ailment that plagued a few different aspects of the musical. I was surprised to find out after I’d seen the show, that it was created and directed by women. As the narrative was so male centric, and the most empowering moment for the three main female roles, was when they sang ‘Holding out for a Hero’ – a song about finding a man. However, the performances by the three main women, Katie Birtill, Rebekah Lowings and Bleu Woodward, who played Princess Hannah, Lady Isabel and Emily respectively were fantastic. All three had a brilliant presence on stage and very powerful voices. And despite my qualms about the song, it was one of my favourite moments of the evening. The performance by the cast, and musicians was fantastic. However it was let down by the fact that I didn’t know what it was trying to do. And I don’t think the show did either. It had a lot of ideas, and almost falls into the trap of being ‘too much’, especially in production value in this case. All said and done It was an enjoyable evening, even if it doesn’t pass the Bechdel test.